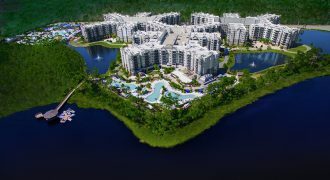 The Grove Resort & Water Park is Orlando’s most exciting new vacation home resort featuring large fully furnished 2 & 3 bedroom luxury residences from the $300s. Experience the magic of living within a 110-acre resort with its own world-class water park featuring dueling two-story water slides, a 700-foot lazy river, two FlowRider surf simulation machines, a zero entry pool, kids aquatic jungle and much more! Located on beautiful Lake Austin, The Grove Resort & Water Park offers the comfort of home with the convenience and excitement of an Orlando resort. For more information go to: groveresidences.com or call us at 407-917-8345.